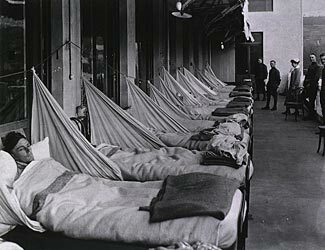 A US hospital ward during the Spanish Flu epidemic, 1918-1919. You probably know that these days few retail stores maintain much inventory, and neither also do the wholesalers and distributors or even the original manufacturers (who also don’t keep much inventory of raw materials, either). This was most recently shown in an unexpected form – the surge in demand for firearms and ammunition subsequent to the Sandy Hook school shooting on 14 December. As of today, six weeks later, most firearms and ammunition remains either unavailable or only available in very limited quantities, and at prices that have more than doubled compared to what they were on 13 December. 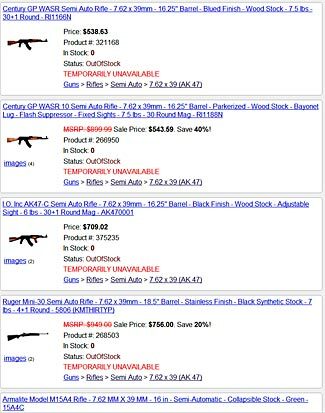 Even though you can surely bet that the manufacturers are scrambling to increase production as much as possible, and even though it is six weeks since the Sandy Hook shooting, and even though surely a lot of the demand for guns and ammo has already been soaked up in the first six weeks, everything remains somewhere between scarce and totally unavailable, and the prices remain ridiculously sky-high. We also see this on a regional basis, too. A power outage – or sometimes even simply the threat of a likely one in the future – is enough to cause the disappearance of generators from store shelves, for example. Or, in another form, currently (at least here in the Pacific Northwest) bad weather in some parts of the country have resulted in vegetable shortages. Broccoli that used to sell for about $1.40/lb for the heads at our local supermarket is now selling for $3/lb, and there’s a lot more stalk on the ‘heads’ than there used to be, too. A nicely printed notice explains that cold weather has affected the broccoli crop. The ‘more efficient’ practices that are being universally adopted in every facet of commerce only work as long as nothing occurs to upset the projected smooth lines for demand and supply, and the very narrow range of values/variables where supply can adjust to reflect chances in demand. As soon as something happens to upset the demand projections, the supply process struggles to adapt. This doesn’t matter too much when it simply means that the price of broccoli more than doubles, so as to encourage people to stop eating broccoli and switch to frozen peas instead. Even the disappearance of most guns and ammo from retailers is hopefully not a life and death matter for most people. But what about when something truly is a life and death matter – when a medical emergency occurs? When any sort of biological event occurs, the flipside of the problem becomes the lack of ‘surge capacity’ in our hospitals. These days, even the annual flu seasons can be enough to overwhelm medical resources – for example, this article reports on some hospitals being overwhelmed with flu patients and having to turn people away and (on page two of the article) how Boston declared a health emergency, due to there being 700 confirmed cases of the flu. Now just think about that. The article doesn’t indicate over what period of time these 700 cases of flu occurred, but if we consider that the flu usually affects a person for less than a week, and if we say that maybe the flu outbreak started in early December, then the 10 January article might imply perhaps a worst case of 250 flu cases a week, not all of which resulted in the victim being hospitalized. The population of the greater Boston area is 4.5 million, and of the central Boston city area alone is about 670,000. To have 250 flu cases – not all requiring hospitalization – is surely a teeny tiny blip in the overall health statistics of either the central city or the larger metroplex, but is apparently enough to trigger a medical emergency. Now think about what would happen if 5% of the population were simultaneously afflicted by a serious disease that did require hospitalization. That’s far from impossible. It might be the result of a bio-weapon attack on the US by a hostile power, or it might be simply the result of a new mutation of the flu or other virus that becomes more virulent and more readily communicated from person to person. The famous Spanish flu outbreak of 1918-1919 saw, in total, 25% of the US population infected (and a 2.5% death rate). Let’s continue to use Boston as an example. It is neither unusually better nor worse than any other city/region in the country, and seeing as how we started with a Boston example above, let’s continue with Boston into this future projection. In the case of Boston, a 5% infection rate would be 225,000 people, and in the central city, about 33,500 people. If something as ordinary and predictable as the annual flu season, with 250 people all affected at the same time, is enough to trigger a medical emergency, what would happen when the 250 people increases not by ten-fold, but by 100 fold or even by 1,000 fold? To view this from another perspective, the ratio of hospital beds to population is currently at a level of about 2.5 beds per 1,000 of population, as a national average, and even though we have an aging population, this ratio is declining significantly (it has dropped 13% in the last decade, as can be seen in this article). So, continuing the Boston example, and assuming they have close to the national average ratio for hospital beds, the greater Boston region probably has about 11,250 beds in total. That sounds like a lot, but compare that to 225,000 people all afflicted with a disease at the same time. That’s one bed per 20 patients. So, the first limiting factor is that these days there are fewer hospital beds as a percentage of the population as a whole. The US has fewer than half as many beds, as a percentage of the population, as does most western European nations (see, for example, this table). There’s more. First, those hospital beds aren’t empty and waiting for sudden unexpected patients. Most of them are full with ‘normal’ patients that come and go all the time. The number of empty beds available for unexpected extra medical requirements is massively less. That’s just guess that, by rescheduling some elective and non-urgent surgeries and other procedures, hospitals could free up half their beds. So we have half of 11,250 beds for 225,000 people – one bed per 40 patients. Second, it is a truism that many doctors and nurses are already overworked. Even if hospitals could surge to beyond 100% capacity for accepting patients, where would the extra staff come from to care for and treat these extra patients? Don’t forget – the doctors and nurses will be as likely to be victims of the epidemic as any other sector of the population, so there might be fewer of them available due to some percentage being afflicted by the illness too. Third, what about medicines, equipment, and other related supplies? The country has been in the grip of a largely under-reported shortage of an increasing number of medicines for several years already – for example, look at this FDA list of medicines currently known to be in short supply. What happens if suddenly the demand for medicines skyrockets ten or twenty-fold (or, more likely, one hundred fold or more)? Where will these medicines come from? The answer – nowhere. What say the care and recovery process involves blood transfusions? Blood banks never have an abundance of additional blood – where will that all come from, too? That is without even thinking about the astonishing fact that at present, medical science is losing the battle against bacteria. Our compulsive over-use of antibiotics is causing most bacteria to evolve into resistant strains more quickly than we can develop new antibiotic agents. And what about all the equipment needed to monitor patients? It is easy enough to quickly add extra beds and to place them anywhere space exists in hospital wards, but what about the patient monitoring equipment? Drips – and drip holders. Even such mundane things as needles – how much spare inventory of needles do hospitals keep on hand? It is wonderful that for most ailments these days, we can be in and out of hospital in only a few days, whereas just a few decades ago, we’d have been spending a similar number of weeks. But this has caused a massive reduction in the number of hospital beds as a percentage of the population, and has reduced the ability of hospitals to accept a sudden surge in patients as a result of some type of medical emergency. We’re not only lacking in spare ‘surge’ capacity for hospital beds. Adding new beds into existing hospital rooms and even into corridors is simple. But we lack the related medical equipment to support each of those new patients, we lack the trained staff to care for them, and we either already have shortages or will quickly run out of medications and even such trivial things as bandages and other assorted hospital supplies. A prepper community is less at risk and can better respond to epidemics due to the reduced population density in the community to start with and the ability to cut down or even eliminate social contact within the community for a period of time. But a prepper community should also ensure it has sufficient basic healthcare/nursing facilities and equipment to handle a demand surge in the event of unexpected medical emergencies. This is not a ‘lights at night’ type map. It expresses US population clusters by showing one white dot per 7500 people. 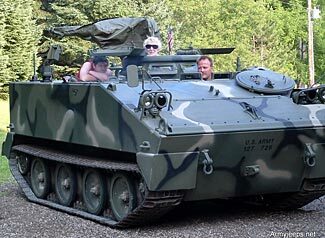 Preppers have a love/hate relationship with nearby groups of other people, especially residents of towns and cities. If the nearby people are friendly and also prepper types, then it is generally good to have supportive people nearby. But if the people are ill prepared, then they are almost certainly going to present problems WTSHTF. Some proximity to people is a good thing, but too much proximity to people of unknown values is not so good. Indeed, even the nicest of people may pose problems if they are not capable of being self-sufficient for an extended time period, and it is almost an unavoidable truth that city dwellers can not be capable of supporting themselves beyond whatever amount of stockpiled food and energy they have at the start of any adverse event. So, in choosing an ideal retreat location, a prudent prepper wants to be away from larger population centers, while still reasonably close to smaller groupings of people. How far away from larger population centers should one locate? There are lots of factors that go into creating that answer, which simply stated can be considered as ‘the larger the group of people, the more difficult to reach you wish to be’ – difficulty being a measure not just of distance but also of accessibility. For example, maybe there is some sort of geographical obstacle such as a river or mountain between you and the population center you wish to avoid. A related factor is that – at some distance – there are population centers all around you – to the north, south, east and west. In avoiding one population center (for example to the north), you want to be careful you don’t get too close to the population center to the south, and so on. Our point here is that in some parts of the country, no matter how hard you try to avoid too large groupings of population, you’re never going to succeed. Shown at the top of this article is a downscaled copy of a US Census Bureau map that features one small dot of white for each cluster of 7500 people in the continental US. You can see a larger and clearer version directly from their website, here. And, for a finer degree of display, here’s a much larger map that shows a dot of white for each 1000 people in the country (you’ll need to expand it considerably to get the full effect). Don’t confuse these maps with the images you might sometimes see that shows the US by night from a satellite. 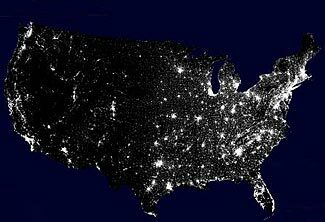 While it is true there is a correlation between lights at night and population, these US Census maps are very much more accurate indicators of where people live than the ‘US from space by night’ maps. Even the smallest map example at the top of this page clearly shows two things. The first is that almost everywhere in the eastern half of the country has such a dense population concentration that you’ll be struggling to find anywhere to locate a retreat at a prudent distance from population concentrations. The second is that much of the west is relatively empty, once you avoid the I-5 corridor and the obvious population clusters around major cities and the coast. But there’s a trap inherent in this representation. Not all of the black space is the same. Some of it is rugged mountain that no-one could support themselves in. Other large parts are desert. There’s more to choosing a location than simply looking for low density population. The Census bureau has plenty of other interesting population density maps. For example, here’s a very useful map from the 2010 census, showing population density by county. That map expresses density in terms of people per square mile, which begs the question – how many people can live on one square mile? Well, that depends of course on whether it is a square mile of lake, of desert, of mountain, of city, or of high quality arable land with plenty of water and a good growing climate. So the answer is a big fat ‘it depends’. But we can make some guesstimates. Firstly, it is more helpful to think in terms of acres – a measure most of us are more familiar with – than square miles. There are 640 acres in a square mile. So that immediately puts this population density map into more helpful context. All the four lighter color/lower density segments have fewer than one person per acre. If you accept the rule of thumb that is sometimes used – you need at least one acre of reasonable quality land for each person, plus some extra space for roading, dwellings, other structures, and miscellaneous ‘non productive’ uses – it seems that even the upper limit of the fourth zone (499.9 people per square mile or 0.8 people per acre) may be almost a sustainable population density, but only if one can establish that the effective land quality is average to good. A clue – although a very limited one – about the quality of the land per county can be gleaned from this 1992 map, which shows how much of each county is used as farmland, and is made somewhat more helpful when matched with this partner map showing the dollar value of agricultural products sold. When you want to start looking at data in smaller sized chunks than entire counties, that is possible too, with population data by zip code also available. When you match that to the land area per zip code, you can work out the population density for zip codes too. But maybe that’s getting a bit complicated. Here’s what we do when helping people compare areas. 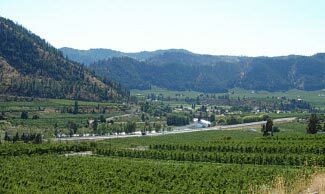 Firstly, we’re seldom looking outside of the American Redoubt states, and most commonly, Idaho and western Montana only. So we look at the counties of interest and their respective populations and population density. Most of them are already suitably sparsely populated. But if we need to work out further data, we then subtract from the total county area and population, the areas of the cities within the county and their populations, giving us a net county area and population for the rural part of the county, and if we need it, the applicable population density. We’ll sometimes draw circles or even irregular shapes around the population concentrations in a region to show the areas to avoid, and maybe also shade out other unsuitable areas, and then what’s left is the area to focus on for finding/building a retreat. But, and as we hinted at before, the major use of this analysis is not so much to find suitable areas within the Redoubt, but rather to disprove people’s claims of suitable locations elsewhere in the country. Whether you’re hoping to find a good location elsewhere, or simply seeking to confirm your choice of location, you’ll find some simple analysis using these tools very helpful as giving one perspective on your location choices and the issues associated with them. If you need more help, you can always engage us to provide more detailed analysis and recommendations. The food we eat is increasingly produced further and further away from where we live. One of the greatest problems that encourages us to become preppers is that the overwhelming majority of people no longer provide/create/grow their own food. These days, over 80% of all Americans live in urban/suburban areas, meaning only one in five people are in the countryside, and not all of these rural dwellers are involved in food production. Barely 100 years ago, the situation was almost exactly the opposite – for every one person in a city, there were four in the countryside, most of whom were involved in agricultural production. So, in a worst case scenario back then, only one in five or one in six people were reliant on the other four or five people for their food. But now, maybe ten people are totally reliant on each rural/farm worker for all their food. If anything occurs to stop the flow of food from the one person who grows/provides it to the ten or however many who rely upon that food to survive, we clearly have huge problems. In addition, we have problems because the one person who makes the food for the ten others is reliant on all sorts of machinery and productivity aids to enable him to grow so much food so efficiently. If something happens to the productivity aids, he’ll be struggling to provide food just for himself and his family, and won’t have any left over for the other ten people who are relying on his ability to grow food productivity for them. Our article on Urban Drift discusses some of these phenomena in more detail. And here’s an interesting chart that shows that growing urbanization is not just a US trend – it is a worldwide trend. Our point in this article is to show how no-one seems to care about the decline in our rural infrastructure. That’s actually understandable, in a way. Back when almost everyone lived very close to the land, it was the central part of the entire country’s consciousness. But today, some people who live in cities have never seen a farm or a farm animal, and don’t know anyone in the circle of family and friends who lives/works on a farm either. Our rural foundations are no longer a core part of our awareness. The reality of rural neglect is reflected in these comments by former Iowa governor Tom Vilsack – now US Secretary of Agriculture. He says that rural America is becoming ‘less relevant’. He is simultaneously right and wrong. Sadly, safeguarding, securing, and boosting our rural economy getting less attention than it needs, even though our reliance on rural America increases steadily in line with our greater and greater concentration of agricultural production in the hands of so few. Rural America is still relevant to us, but we don’t seem to accept that so willingly now. And so we have city-dweller idealists writing up new legislation and new restrictions on farming operations, based not on a real world understanding of farming requirements, but on a ‘don’t confuse me with the facts’ idealized way of how food production should operate. Some of these burdens are ecologically based (such as the famous threat that plowing fields shouldn’t create dust), and others are financial attacks, such as the provision to tax farm estates valued at over $1 million at a 55% rate. This article exposes the threat to farm viability from the new death tax. A death tax is perhaps appropriate, because it exposes society’s clear death wish – ie, to destroy our local sources of food production, making family farms less viable (and/or increasing their costs and thereby our food costs too) and either concentrating still more farming potential in corporate megafarms (companies don’t ‘die’ so aren’t threatened by death taxes) or forcing us to turn to increasingly distant food sources in other countries. So we are changing from eating the food we grow ourselves, to eating the food our neighbors grew, to eating the food that farmers grew less than a day’s horse and cart journey away, to eating the food less than a day’s truck journey away, to eating the food less than a day’s plane journey away, to eating food grown by farmers in some other country, thousands or even tens of thousands of miles away from us. In the past, when four or five farmers were growing food for each city dweller, if anything failed or went wrong, it was no big problem. The food was largely being grown locally, and by hand. Indeed, what could go wrong? But now we are relying on farming operations totally out of our control, thousands of miles away. If fuel supplies become restricted, how will that food travel thousands of miles in only the very few days it has before it perishes? It probably can’t and won’t. First, we need to be more aware – and supportive – of rural issues and infrastructure within the US. 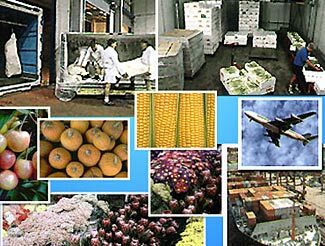 Second, we need to have a sufficient supply of food on hand to allow us to survive a loss of third-party food supplies. Third, we need to have a way to transition to growing all our own food before our stored food is exhausted. The second issue is fairly obvious, but the need to be able to grow all our food is one with major implications – particularly if you live in a central city apartment. Your balcony won’t be big enough to grow enough food. You need a rural retreat with sufficient arable land to allow you to grow the food you need. Ideally, that retreat should already be in operation as a farm. That way, there are fewer unknowns and already existing routines and processes and procedures, and less to go wrong if you need to move there in a hurry. Wind Power – Maybe Not as Good as Hoped? 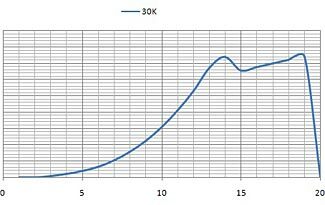 This graph, typical of many wind turbines, shows power output (vertical axis) against wind speed (m/sec) for a typical wind turbine. There is only a narrow band of wind speeds suitable for measurable power generation. One of the essential requirements of any retreat has to be some type of renewable energy source. As we’ve stated elsewhere on the site, the ultimate and paramount issue in any post-WTSHTF scenario is availability of energy. Almost everything else in your life is or will be energy dependent – certainly shelter, definitely food, and maybe even water too. Whether the energy comes from yourself (worst case scenario), from hoarded supplies of energy sources such as propane and diesel (which are only good until they run out) or from other sources, sourcing energy is your most important issue. There are two or three obvious renewable (or ‘free’) energy sources – hydro, solar, and wind. Wind has some appeal to it, particular in its abstract form, and particularly from reading the glossy brochures, and in terms of cost, the capital cost per kW of generating capacity is very competitive with other renewable energy sources. But there is a lot more to wind power than meets the eye, and most of the added issues are negative rather than positive. To help you better understand wind power, we look in this article at some of the less talked about downsides of wind turbines. Hydro is easily understood, and solar is not much more complicated. If you’ve got an accessible flow of water dropping from a higher level to a lower level, you’ve a chance at hydro, and the more the sun shines, and the bigger your solar array, the more solar power you can hope for. But wind is a different matter entirely. With wind power, you need wind speeds that are greater than the minimum which your turbine requires, but less than the maximum. At greater than maximum speed, the turbine blades will ‘feather’ – they will turn into the wind and the turbine will cease to spin, and no longer generate electricity. This is different to solar and hydro – there’s no such thing as ‘too much’ sun or ‘too much’ water. There’s also less of an issue with ‘too little’ water/sun either – sure, no water means no hydro power generated, and so too does nighttime mean no solar power generated. But the minimum amount of water or sun needed to start the electrons flowing is truly very low, whereas most wind turbines sit lifeless until wind speeds exceed somewhere in the 5 – 15 mph range. So that’s the first disadvantage of wind. Wind works best in a location with steady (rather than gusty) winds that flow regularly in the 25 – 40 mph range. Not many of us have such locations. Most of us have insufficient ‘suitable’ wind to make a wind turbine a sensible concept under any conditions. Even if you do have a reasonably good location, you need to have a back up plan for when you have a ‘wind drought’. We all know that just because a place averages so much rain in a month, that doesn’t mean it is guaranteed to rain an even equal amount every day, and the same is true of wind, too. What happens if you have no wind, or too strong wind, for an entire week and are unable to generate any wind-sourced power during that time? At least with solar, even the cloudiest day will still give you some power, but with wind, you could conceivably end up with a ‘wind drought’ that lasts a week or longer. That’s a very big problem to confront. Most solar systems are backed up by standby batteries, with the idea being that during the day, the solar cells generate enough power for your needs plus a surplus to be stored in the batteries, then when the sun goes down, you switch to the batteries for the night, until sunrise the next day. Plus, with a bit of planning, you can shift your electricity consumption so that most of it happens during daytime and less of it happens at night, reducing the amount of power you need to store. That only requires a 12 – 15 hour or so supply of stored power. But what if you’re planning to be able to withstand a seven-day period with no wind at all? You need at least ten to fifteen times more batteries (which – trust us – is a lot of batteries), plus the excess wind generating capacity to quickly recharge them. Now, for the further bad news. Even if you do have reasonably suitable winds in your area, there are two other problems with wind power. Reliability/maintenance, and longevity. Next time you drive past a ‘wind farm’ have a look at how many of the turbines aren’t spinning. If the ones around them are turning, then the ones that aren’t turning have failed for some reason or another (that’s not to say that all the ones which are spinning are actually working properly either, of course – some electrical failures don’t result in the turbine blades stalling). Depending on the location, the design of turbine, and the speed with which failed turbines are repaired, you’ll probably observe anything from one in 20 to one in 10 are not turning when they should be. Think about that – if we say it takes on average 4 days for a failed turbine to be repaired, and if you see one in 15 turbines are not turning, that suggests that on average that every turbine is failing once every 60 days, and with four days down out of 60, that is a 93% uptime rate. Okay, wind enthusiasts, let’s take an optimistic view if you prefer. Let’s say only one in twenty turbines is failed, and let’s allow an entire week for the turbine to be repaired – that suggests the failure rate is once every 140 days, which is still nearly three failures per turbine per year. That is a 95% uptime rate. And, just to be fair, wind naysayers, let’s say one in ten are failed, and they can be repaired in two days. That means an average time between failures of twenty days – not quite three weeks. Ouch! You should also remember that these turbines aren’t working 24/7. Their duty cycle might be more like 8 – 12 hours a day – in other words, they are only working a third to a half of the time, and even at that low rate of application, they are still failing repeatedly. In a ‘grid down’ situation and with the progressive loss of high-tech componentry and high quality machining, do you really want to rely on such maintenance intensive things as wind turbines for one of the most essential parts of your ongoing survival? What will you do when you run out of spare parts? The other dismaying thing is the total service life that you might get out of a wind turbine. It has generally been considered that you can expect 20 – 30 years out of a turbine before it needs complete replacement. But what if that’s not so? What if you can only get ten years of life from it. What happens when the turbine totally fails? Here’s an article which reports that the actual life span of wind turbines in Britain is proving to be significantly less than was optimistically projected. There’s such a huge lobbying effort behind wind power generation (in both the UK and US) that this type of data is unlikely to be widely reported or commented on, but go read the article and form your own conclusions. It is probably okay to plan for a 25 year life for your Level 2/3 retreat’s power source. But only ten years? That’s not as long as you might think – the human mind tends to find it hard to appreciate the time to a future date, so as a way of appreciating it, think back ten years instead. That’s probably not such an impossibly distant point in time. And so neither is ten years into the future, either. As a comparison, solar cells are also often rated vaguely for a 25 year or longer life, but unlike a wind turbine, that doesn’t mean that at the end of their rated life, they stop generating power entirely. Assuming they don’t suffer ‘catastrophic failure’ (ie someone dropping a brick on them!) the output they provide slowly diminishes over time – generally about 0.5% every year. So after 25 years, a solar cell array has lost only about 12.5% of its maximum power generating capacity. This article points out that some solar cell installations are still providing 80% of their initially rated power after 40 years, and show no signs of failing. Solar cells can easily outlast their owners. Not so, wind turbines. You’re probably getting the feeling that we don’t like wind power. That’s moderately correct – we love the abstract promise of wind power, but we’re not very happy with the present day reality. We could be persuaded, however, to add a wind turbine or three to provide another semi-redundant source of power to our retreat, but as a supplemental ‘bonus’ power source rather than as a critical must-be-working source. This not only give more total power, but also adds another fail-safe level of redundancy. Maybe a ‘once in a thousand years’ hailstorm destroys a large part of your solar cell inventory. Maybe your hydro dam breaks. Maybe any one of many other catastrophic events occur, in which case you’d be very appreciative to have spread your risk and to have deployed some wind power too. If you do choose to adopt wind power, we’d recommend deploying multiple wind turbines. That way, when one fails, you don’t suddenly lose all your wind power. You ‘only’ lose half (if you have two), or a quarter (if you have four) and so on. Needless to say, you’ll need to have a truly impressive inventory of spare parts, and beyond that, a high-end machine shop to allow you to repair and rebuild damaged components as well as simply replace them. You’ll also want to also add to your battery storage capacity, or deploy some other form of energy storage so that you can take the spare wind power, when it is available to you, and put it to some good use. Wind power is a very specialized type of power that has many constraints and concerns associated with it. The wind speeds with which the turbine will actually generate power are concentrated in a very narrow band. The turbines themselves are very maintenance intensive and prone to failure on a regular basis. And their total service life may be much shorter than originally anticipated and promised. Wind power may be acceptable as a ‘top up’ source of power, particularly in our present world where the electricity grid has multiple redundant power sources and can manage even if all wind power was to fail simultaneously. But we do not recommend wind power as a prime source of power in a retreat/off-grid situation. If you choose to include wind power as an energy source, you’d need to reduce the impact of turbine failures by investing in multiple turbines – at least three, so that having one turbine go offline would only reduce your power by 33% or less, hopefully giving you still sufficient for your essential needs. You’d also need an extensive inventory of spare parts, and a much greater reserve bank of batteries to tide you over sometimes lengthy periods when your turbine can’t generate due to the wind being either too weak or too strong.